Keywords: In this decentralized system the wastewater from a college in India with 2600 student is treated and the nutrients and water is reused for agriculture and irrigation purposes. In the multi-step treatment process no energy is required. Moreover, during the anaerobic treatment process, 97% of the methane is collected and can be used for energy purposes. 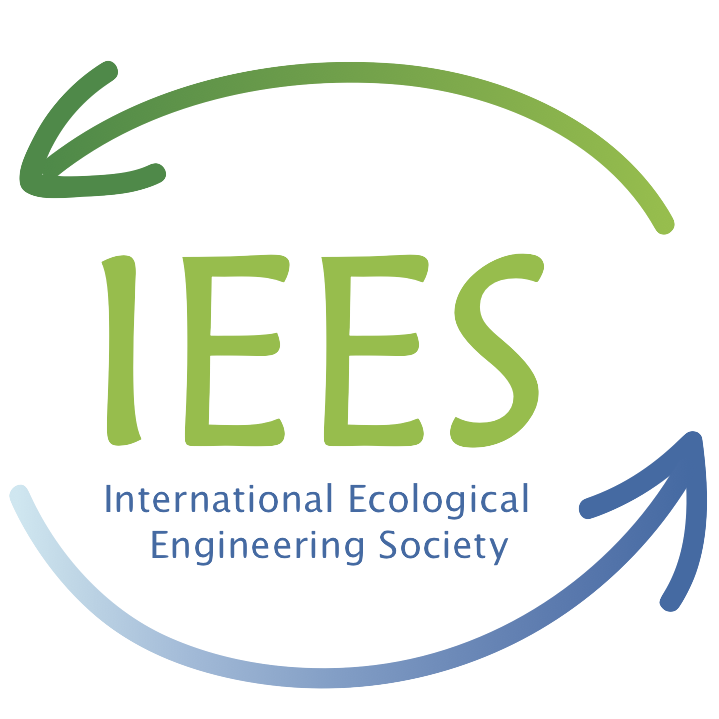 This project shows that there are cost effective, sustainable and reuse-oriented sanitation alternatives for non-rural settings in developing countries. College with 2600 students per day (1300 morning 1.-6. standard, 1300 afternoon 7.-12. standard); besides school time, the campus is used for cricket matches and wedding ceremonies (up to 800 people). The board of the college decided to install a new eco-friendly toilet centre. The toilet centre adjacent to existing school building provides independent enclosures for girls and boys. Treatment of wastewater from toilet building in a Decentralized Treatment System (DTS); 5 different treatment steps: Biogas Settler, Anaerobic Baffle Reactor (ABR), Fixed Film Reactor (AF), Constructed Wetland, Polishing Pond. Because of the possible further extension of the toilet block with a second level, the treatment system is designed to handle also additional load of 12kg COD/day and peak flow of 1m3/h (about 125 toilet uses/h). Waterless urinals for boys with a membrane valve which prevents odours. Urine is collected in a 3m3 Syntex tank outside of the toilet building. The Biogas Settler, ABR and AF are made of cement blocks, with outside and inside plastering for water tightness. Additional special plaster layers are added inside Biogas Settler and ABR for gas tightness. Slabs for Biogas Settler, ABR and AF are made of RCC. For the sealing of the wetland and the pond, 2-3 layers of special plastic sheets have been laid at the bottom. Pipes are made from PVC. Treated water is reused on-site for irrigation purposes. The biogas from the Biogas Settler (gas pressure 45cm water column) and ABR (gas pressure 20cm w.c.) is reused in a nearby Ecosan-Exhibition Hall for running a gas stove and gas lamp. The urine from the boys’ waterless urinals is used by a local Agricultural College for research on the fertilizer effect of urine application in agriculture. The system has to get desludged periodically (every two years) The nutrient-rich sludge can get co-composted with organic material (e.g. kitchen waste) to form a valuable soil amendment for gardening. Combined with the reuse of nutrients and water, this treatment system can serve as a sustainable alternative to conventional centralised wastewater treatment systems. It works best in hot climates, as the anaerobic bacteria in the treatment system favour warm temperatures. In suburban settings and for community complexes in India, this decentralised treatment system has proved to be more cost effective than conventional centralised sanitation solutions. Urine from male users is stored and hygenised in a separate tank and is used as a nitrogen rich liquid fertilizer by an agricultural college. In this way, nutrients are brought back to agriculture (closing the nutrient loop). 97% of produced biogas gets captured for reuse; almost no release of methane (serious greenhouse gas) into the atmosphere; thus it helps to reduce global warming. Treated wastewater is collected and used for irrigation on the school campus in the dry season (closing the water loop). Settled sludge in the biogas settler and anaerobic baffle reactor can be composted and used for agricultural purposes. Whole treatment system works with gravity flow only; no power is required to run the system. No expensive centralized sewerage system is needed, as wastewater is treated and reused on site. 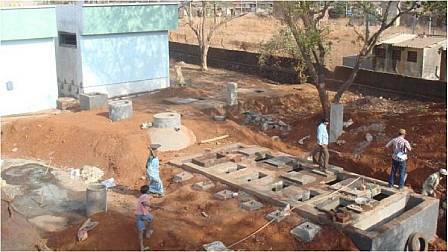 Financial scale: Construction Costs: 430’000 Indian Rupees (~10’500 USD) for the treatment and reuse system for 2600 students. Environmental conditions: The predominant weather pattern is the monsoon. From June to September there is an (over-) abundance of water, whereas in the other time of the year water shortages are common. Description of special local conditions: The college is situated in Badlapur, a fast growing suburb of India’s biggest city Mumbai (Bombay). The provision of a sufficient water and power supply for the growing population is a major challenge. Conventional centraslised wastewater treatment plants are – if existing at all – usually completely overloaded. Why this is ecological engineering: In this decentralised wastewater treatment and reuse system, most of the nutrients in the waste water are recycled. Consumption of water for sanitation is highly reduced, and the required water is recycled for irrigation purposes on the campus. No power is required to run the system – an advantage over conventional treatment plants. 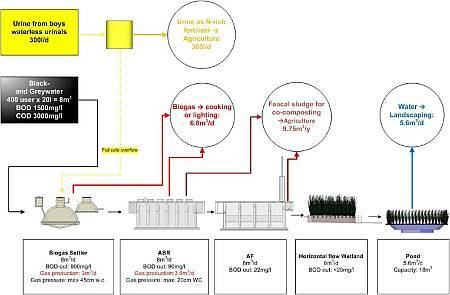 Further, energy (biogas) can be produced from the wastewater.